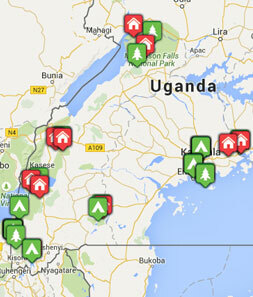 The Budongo Central Forest Reserve is in the north west of Uganda about 2 hours drive south of Murchison Falls. It is part of the Albertine Rift, which is in turn part of the Great Rift Valley. The forest covers 825km2 and of this about 430 km2 is continuous forest. It is a medium altitude, semi-deciduous tropical rainforest and it was gazetted as a reserve in 1932. Budongo means fertile soil, and there are 450 tree species which thrive here. The National Forest Authority of Uganda is responsible for this and all forests in the country. Apart from the fabulous flora, this forest is also home to 330 bird species, 95 mammal species, 29 amphibian and 40 reptile species. The two main reasons to come to Budongo are the excellent birdlife and the chimpanzees. 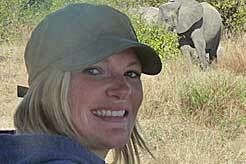 The concession zone where the best chimp trekking takes place in Budongo is called Kaniyo Pabidi. The forest as a whole has about 600 chimpanzees, some of which are wild, others which are classed as the research group, and others which have been habituated and can be visited by travellers. The habituated group is currently about 60-70 chimps. The chimp research in this area was started in 1962 by Dr Vernon Reynolds. In 2006 the Jane Goodall Trust got involved here too, adding their backing to this lesser known area. The forest is not too hilly, so the walk is not overly strenuous. On average the experience will be about 3 hours long, which includes a maximum of 1 hour with the chimpanzees. Taken over the year, there is a roughly 60% chance of seeing the chimps, but this includes the wet seasons (when they are harder to find), so outside of the wet season the chances become really very high that you will find the group. About a 90% success rate is common in the drier months according to the guides. The trek is offered twice daily and a maximum of 12 people can visit (split into 2 groups of 6 people). No children under 15 yrs old are allowed to trek to the chimps here. There is also the possibility of joining a habituation day, where you can join the research guides and follow the less habituated chimps all day to watch and learn. There are only 2 guests per day allowed to do this so advance booking is imperative. 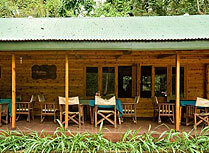 Budongo Eco-Lodge is a simple but good place to stay for Budongo Forest - in fact it's the only place!